Thanks to Joan Murphy, daughter of Joseph Bacigalupo for providing us with the names in order of their position in the photo. Note: crew names provided by Hyman Blumenstock; Rank for enlisted taken from 61st BS Enlisted Roster dated: 15 September 1945. 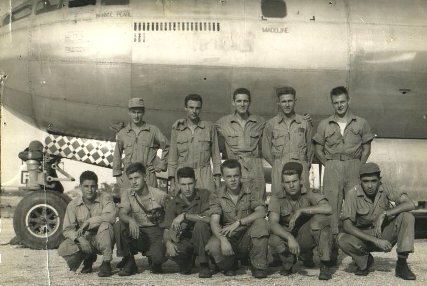 Update 03/26/01: One incident that is remembered by Hyman Blumenstock, Bombardier, was that one the way out to Guam we picked up a new B-29 in Nebraska. We thought there was something wrong with an engine during the first flight out and reported that fact when we stopped over in California. As he got out of the plane after landing, he sprained his ankle and reported that. Blumenstock states, "I believe that they probably thought we were trying to get out of going overseas and assigned the plane to another crew. Maybe it was just because of my sprained ankle. We found out later that that particular plane crashed at sea during flight to Hawaii and everyone was lost". Crew 46's story indicates that Arland Christ-Janer was a member of this crew. However there is no documentation available regarding this. His position is unknown. He did however serve on P-1's 3rd replacement crew. Source: Hyman Blumenstock; Bernie Greene & "History of the 39th Bomb Group"